In this module we will discuss how to conduct one-sample and two-sample Students t-tests of sample means when the variance of the sample is unknown, testing the equality of the means of several samples, and z-test of sample means when the variance is known. The Student t distribution arises when estimating the mean of a Normally distributed population, particularly when sample sizes are small, and the true population standard deviation is unknown. where s is the sample standard deviation, and n is the sample size. The R t.test(x,mu) method tests the null hypothesis that the sample mean of a vector of data points, x, is equal to mu under the assumption that the data are Normally distributed. Note that it is up to the analyst to ensure that the data are, in fact Normally distributed. The shapiro.test(x) method in R employs the Shapiro-Wilk test to test the Normality of the data. with s_1^2 and s_2^ being the variances of the individual samples. This test is also know as Welch’s t-test. The R method t.test(x,y) tests the null hypothesis that two Normally distributed samples have equal means. The option var.equal=T implements the t-test under the hypothesis that the sample variances are equal. When using the var.equal=T option, it is up to the analyst to do tests to determine whether or not the variances of the two samples are in fact statistically consistent with being equal. This can be achieved with the var.test(x,y) method in R, which compares the within sample variances to the variance of the combination of the x and y samples. 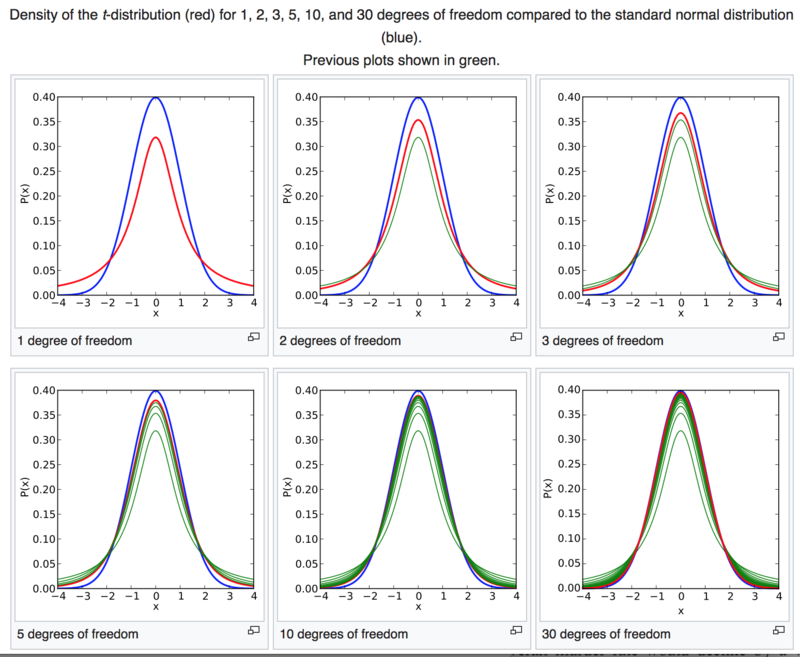 Limitations of using Students-t distribution for hypothesis testing of means: hypothesis testing of sample means with the Student’s-t distribution assumes that the data are Normally distributed. In reality, with real data this is often violated. When using some statistic (like the Students-t statistic) that assumes some underlying probability distribution (in this case, Normally distributed data), it is incumbent upon the analyst to ensure that the data are reasonably consistent with that underlying distribution; the problem is that the Students-t test is usually applied with very small sample sizes, in which case it is extremely difficult to test the assumption of Normality of the data. Also, we can test the consistency of equality of at most two means; the Students-t test does not lend itself to comparison of more than two samples. Under the assumption that several samples have equal variance, and are Normally distributed, but with potentially different means, one way to test if the sample means are significantly different is to chain the samples together, and create a vector of factor levels that identify which sample each data point represents. This is known as an Analysis of Variance (ANOVA) analysis. Essentially, the F-test p-value of tests the null hypothesis that the variance of the residuals of model is equal to the variance of the sample. Now we have some information on how the means of the factor level differ. Note that the F statistic p-values from the lm() and aov() methods are the same. For a given cut on the p-value, alpha, with a two sided Z-test, we reject the null hypothesis when the absolute value of |bar(X)-mu| is greater than Z_(alpha/2), where Z_(alpha/2) is the (100-alpha/2) percentile of the standard Normal distribution. You can also do one-sided Z-tests where you test the significance of Z<mu or Z>mu. However, unless you have very good reason to assume some direction to the relationship, always do a two-sided test of significance instead. For this reason, when the sample size is large, you can equivalently do a Z-test instead of a t-test, estimating sigma from the std deviation width of the sample. To run the following code, you will need to have installed the BSDA library in R, using the command install.packages(“BSDA”), then choosing a download site relatively close to your location. In this example the Z-test rejects the null (even though it is true), while the Student t test fails to reject it. If this were an analysis that is made “more interesting” by finding a significant difference between the X_1 and X_2 samples, you run the risk of publishing a faulty result that incorrectly rejects the null because you used an inappropriate test. In a perfect world null results should always be considered just as “interesting” as results where you reject the null. In unfortunate reality, however, researchers tend to not even try to publish null results, leading to reporting bias (the published results are heavily weighted towards results that, incorrectly or correctly, rejected the null). And it turns out that you’ll always get a smaller p-value from the Z-test compared to the Students t-test: in the plot above that compares the Student t distribution to the Z distribution, you’ll note that the Students t distribution has much fatter tails than the Z distribution when the degrees of freedom are small. That means, for a given value of the Z-statistic, if the number of degrees of freedom are small in calculating the sample standard deviations, the Students t-test is the much more “conservative” test (ie; it always produces a larger p-value than the Z-test). Thus, if you mistakenly use the Z-test when sample sizes are small, you run the danger of incorrectly concluding a significant difference in the means when the null hypothesis is actually true. For large sample sizes, there is negligible difference between the Z-test and Students t-test p-values (even though the Students t-test p-values will always be slightly larger). This is why you will often see Z-tests quoted in the literature for large samples.